Aputure brought their yet-to-be-released RGB LED Light to IBC 2018 in Amsterdam, and I have a feeling this LED is going to revolutionise the world of indie filmmaking with a very aggressive price point and impressive unique features. For those of you that attended IBC this year, I hope you had a chance to check out the Aputure booth and see their latest products, including the new Aputure Amaran MW and their new Fresnel X attachment for the Aputure 120D II/120D and the 300D COB LED lights. As usual, the Aputure booth was rammed, but I got a chance to chat for a bit with Ted from Aputure about their new RGB LED light that is set to start shipping sometime around NAB 2019. Making its IBC 2018 trade show debut, the Aputure RGB Light was previously shown as an early prototype at NAB 2018, however now at IBC they showed a new and improved working prototype of the light with an improved controller and a full range of built-in Rosco and Lee color gels and special effects such as fire, cop car lights, and many more. Aputure are setting their sights on the next level of RGB lighting instead of bringing out their own version with features that are already available on the market. In addition to the built-in 300+ Rosco and Lee gels, the Aputure RGB light will have a unique feature called the Color Picker. This will be something quite special and it will come in the form of a remote with which users will be able to scan not just the colors of other lights, but also colors of textures and basically everything around you and the light will replicate it, providing endless opportunities for creative lighting. 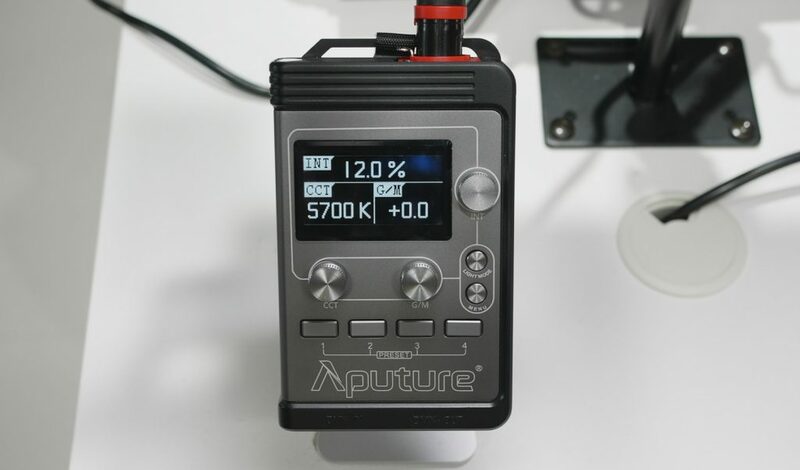 The Aputure RGB light will have a high TLCI of 95, which is very good; the light is also quite punchy – it is rated at a 300 Watt output and the controller (even though it will change and be improved before the official release) offers quick access to the built in gels and effects. 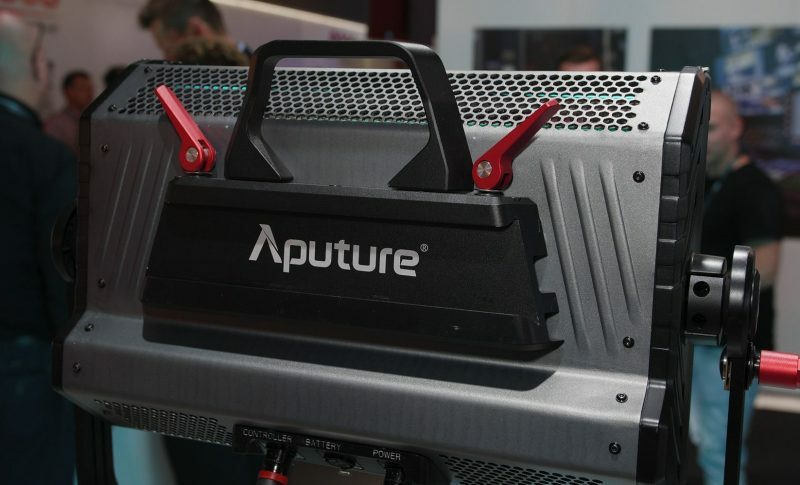 Aputure have been pioneering affordable and high-quality LED lights for years now, and have confirmed the price of their upcoming Aputure RBG LED light will be $1500 USD, which is very affordable compared to other alternatives from brands such as Litepanels, Kino Flo, or ARRI, which are twice or even 3x more expensive. The Kino’s, ARRI’ and Litepanels Gemini‘s are all fine high-end pro lights designed for a different type of end user; they are lights each with their own advantages and disadvantages, however because of their premium sticker price, they are often (in the case of the ARRI Skypanels especially) mostly rental items, which is fine in itself if that’s the production world you live in. Aputure are giving owner-operators and DoPs starting and building their careers a chance to own a high-end piece of lighting gear at an affordable price that will help them raise their game (of course provided the skill is there in the first place). The Aputure RGB Light is officially slated to ship a week or two prior to NAB 2019 (which is scheduled for 6-11 April, 2019), which means end of March or first week of April will be an incredible time for indie filmmakers, so better start saving now if you don’t have $1500. This light will be in high demand and I can’t wait to add it to my lighting arsenal. Stay tuned on the blog for more of our IBC 2018 coverage.